We had a great re-match with Vanyon and his MSU Dwarves and I am happy to present yet another report from that unique encounter. Vanyon is still searching for his perfect army list and made some significant changes. I made some little addition too. Vanyon was not happy with his Gyrocopter last game and he also mentioned that he has problems with two things: small and fast enemy units and misfiring cannons. Hence the changes to his army list were to counter that. So, laser guided cannons. They were good before, they are going to be even better now! Any of my unit is also quite vulnerable to crossbows so I had to come up with some good idea how to counter that. Moving fast on flanks can help but then I could meet a welcoming party of some miners showing up when I really don't want them to show up yet :) With two units the chances of at least one emerging early in the game are much higher. I didn't know, however, that in order to accommodate these changes and additions Vanyon had to give up Strollaz and I deployed in a way that took into account his early move. I found out I still have some points to spend so to see how it might work (especially against some character, perferably runelord) I added bladelord with Talisman of Loec. So far I had no need for either of Bladelords but I am willing to give it a try. Might be a nasty surprise for some too. Yet again Dwarves won the roll off and the battle began. This time Dwarves adopted more traditional castle formation around the hills. Longbeards murmured something about proper castle formation in their times which consisted of proper amount of warriors in huge blocks. At least there were no these annoying Thunderers with their too loud and too smelly weapons. On the Eastern flank troll slayers formed a death zone for any elven unit foolish enough to advance too quickly. On the West Rangers positioned themselves in between the rocks confident that even elves cannot pass through such difficult terrain quickly enough. The Dwarven army clearly wanted Elves to come to them and started to send warm invitations to do so in the form of crossbow bolts and cannon balls. As a result one unit of fast cavalry was dead and some White Lions and Swordmasters were knocked down too. Runelord stroke the rune properly but probably a little bit too carefully as Ellyrian Reavers didn't suffer any damage and only slowed down their advance. Seeing that Dwarves are reluctant to move Elves advanced as quickly as possible. White Lions on the West showed Rangers what it really means to be born as a highlander and attacked with ferocity of their native predators. Four rangers fell but the unit held this time. Archers swift reformed and still shot at Longbeards killing two of them while Reavers managed to shoot down one of the slayers waiting in the woods. Archmage could not breach defenses of the runelord just yet. A little more active among Dwarven units this time as first unit of Miners showed up behind enemy lines. On the East Dragon Slayer decided to encourage Elves to attack him and left the unit. In the center Hammerers positioned themselves for some counter-charges. Crossbows and cannons kept firing. Unfortunately the cannon ball that hit great eagle didn't kill it outright and it was up to the Miners to finish the job. Thanks to encouragement from the sound of their holy Anvil they doubled their efforts and caught great bird of prey. However, somehow they didn't kill it either but simply chased it off the battle field. Their companions from the Ranger unit could not hold long enough, however, and broke from combat soon to be run down by Lions who refused to restrain their fury in order to meet new threat. 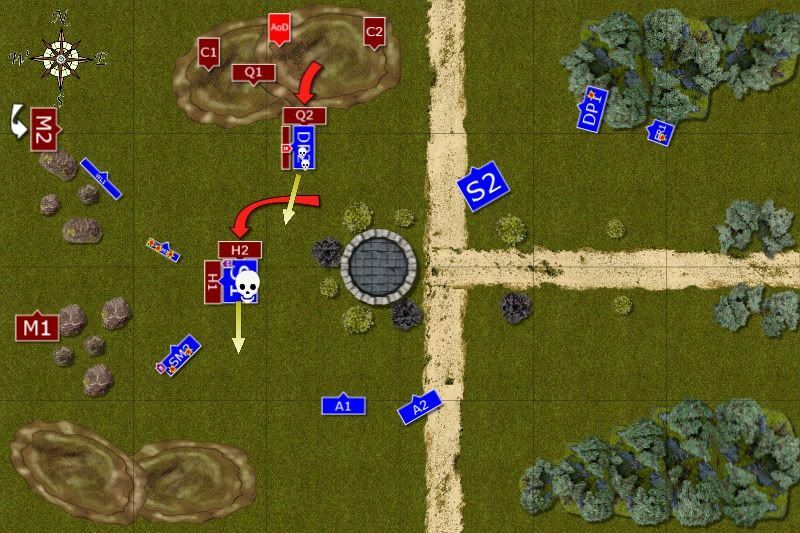 Elves continued their advance and this time units on the East attacked their enemy. Both heavy cavalry units charged Troll Slayers and inflicted serious casualties but orange-haired maniacs didn't care and survivors kept fighting. Ellyrian Reavers ignored insults shouted by the Dragon Slayer and returned the favor in the form of swift arrows one of which was buried deep in the chest of Dwarven warrior. Elven Archers managed to kill two more Longbeards while Archmage cast protective Shield of Saphery on the heavily depleted unit of Swordmasters on the West. Initial charges of Dwarven units all failed. 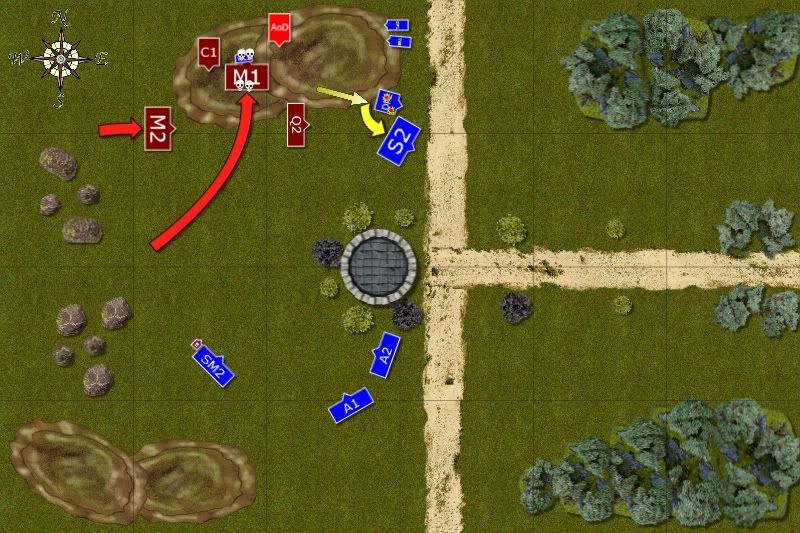 Miners could not reach White Lions while both units of Hammerers misjudged the charge distance towards the other regiment of Chracians. However, the Runelord used his powers and one unit of Hammerers found enough strength to get into combat eventually. They even knocked down 5 Lions but stubborn elven elites held firm. On the East single Slayer kept fighting among the woods against elven heavy cavalry but his brethren in the center died to a Dwarf. 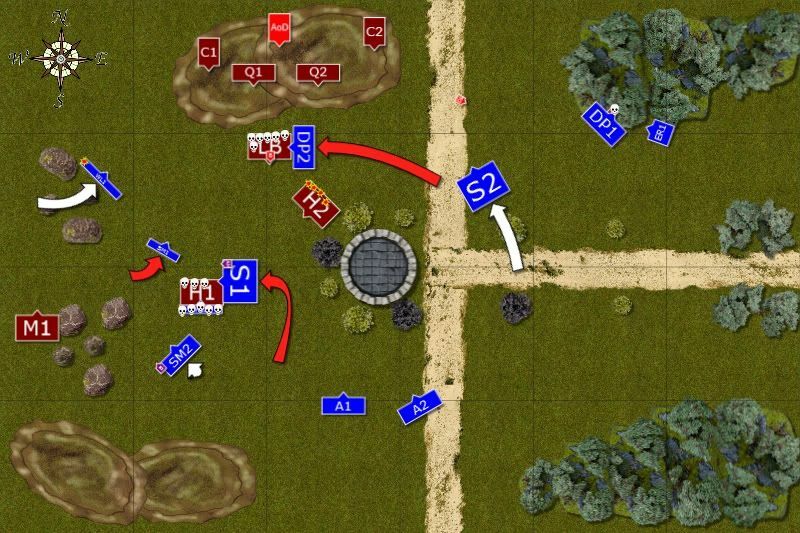 That opened a path for the heavy cavalry to many important targets. 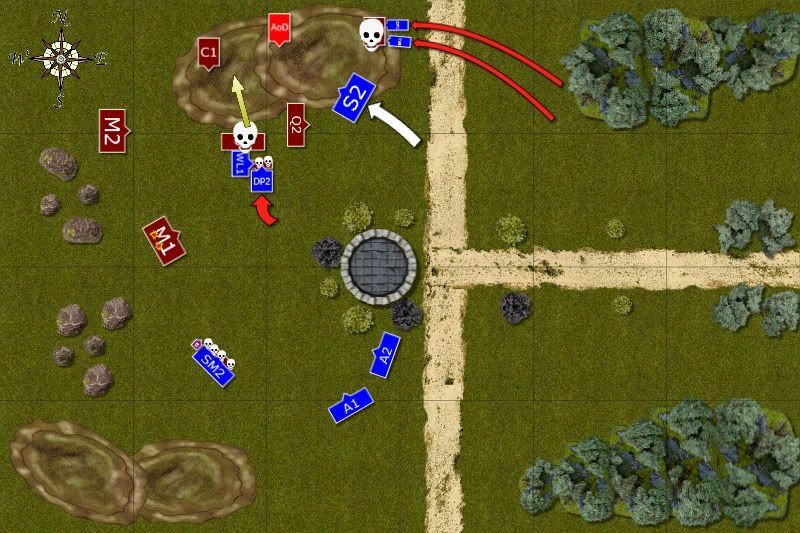 Shooting again was very efficient as Western cannon killed the eagle while Eastern one loaded some nasty grapeshot that killed two Reavers and panicked survivors. To add insult to injury one more was lost in the wild race in the forest. Dwarven cannons were safe again. Bold attack of Hammerers against White Lions sees Swordmasters in a bad spot to counter-charge and only Spearelves led by Archmage can attack the flank of Dwarven elites. That attack does not go as planned and not only White Lions die to an Elf but Hammerers hold and reform to face their enemy. What is more another unit is close enough to charge the exposed flank of elven unit. Archers try to discourage them but can't inflict enough casualties to shake resolve of the Dwarves. Archmage summons his powers and this time even Runelord is helpless as flames engulf Hammerers and then runic talisman on the armor of Dwarven BSB cracks laudly and is shattered to pieces. Dragon Princes decide to attack the most valuable target and charge the flank of Longbeards. 4 Swordmasters make an attempt to join the fight but are too slow to attack at the same time. Dragon Princes charge is strong and many Longbeard lie dead before they even can strike back. They are visibly shaken and relatively young Battle Standard Bearer has a difficult time to convince them to keep fighting. Only when he grimly states the obvious fact that they are too old to be Slayers they decide to lock shields again and refuse to yield. (EDIT: I needed to kill just one more Dwarf to decrease their numbers below 5 models but I failed to do so and they remained steadfast!). The lone Slayer in the woods finally met his death too as did Dragon Slayer who didn't dodge that last arrow which pierced his heart. Elven attack was stopped and now Dwarves were in a great position to counter-strike. Quarrelers were happy to grasp their great weapons and charged Dragon Princes, killed two and the remaining knights had to retreat but fortunately were not caught by Longbeards. Hammeres stormed into Spears who fought valiantly but could not withstand such a strong assault and broke only to be caught in hot pursuit. One of the Dwarven unit was so fast threat they hit the flank of Swordmasters nearby! That can prove to be a costly mistake. White Lions charge Longbeards determined to finish them. They kill Dwarven BSB but remaining Lonbeards hold. Lone Bladelord yet again fails to reach combat in time. His companions kill 4 Hammerers but the rest of the unit stubbornly holds. Archers aim at the second unit of hammerers but manage to kill only 2 of them. On the East Dragon Princes attempt long charge but they lose one knight in the woods and the impetus of the charge is wasted too. Yet again Quarrelers are called to get close and personal and charge White Lions. Somehow Chracians manage to avoid heavy blows, lose only one of their number, kill one Quarreler and Longbeard champion and stubbornly hold knowing that cavalry is on their way to the rescue. Miners manage to attack Bladelord and kill him (thanks to the Anvil again!) but are not fast enough to overrun and stop elven knights from joining the fight. Hammerers, obviously annoyed by elven archers, charge Swordmasters along their brethren from the second unit. Unfortunately for Dwarves, they are not a match for warriors of Hoeth and one unit dies and second is reduced to 4 warriors only. Then cannon and second unit of Quarrelers kill no less but 7 Spearelves while second cannon kills yet another knight and only Drakemaster remains. Elven cavalry finally reaches the cannon - better late than never! Elven units have a chance to avenge their fallen companions. Drakemaster and lone Reaver charge cannon and finish it off on the charge. Second unit of DP charges Longbeards and kill them all. Then, to everybody's surprise, Quarrellers fail their steadfast test and are run down by remaining Lions and Princes and second cannon panics too! Finally, Swordmasters finish remaining Hammerers but are too far away to contribute to the battle any more. 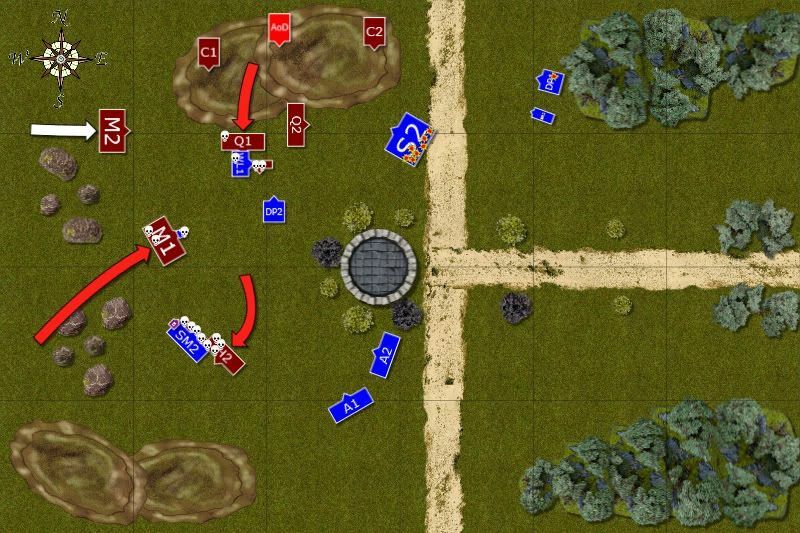 Spearelves close towards the Anvil for that last turn charge with remnants of the cavalry units. 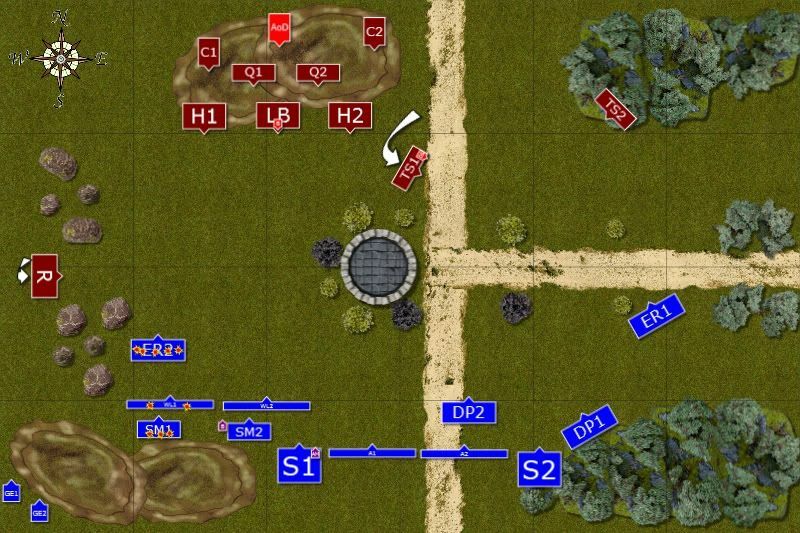 Both units of Miners charge DP who retreat but in the process lose one of their numbers while breaking through Spearelves and even panic them too! Miners redirect towards White Lions and cannot reach them but then Anvil strikes again and one regiment of Miners makes it eventually. Two Chracians fight bravely but there are too many of the Dwarves and they die in the end. Remaining Quarrelers aim at lone DP and get him too. Elven units are either below combat strength or in no position to charge the enemy. Both armies are heavily bloodied and the last act of the battle is performed by Archers who aimed at Miners. Yet again, they kill some but not enough to shake the Dwarves and the battle finishes. 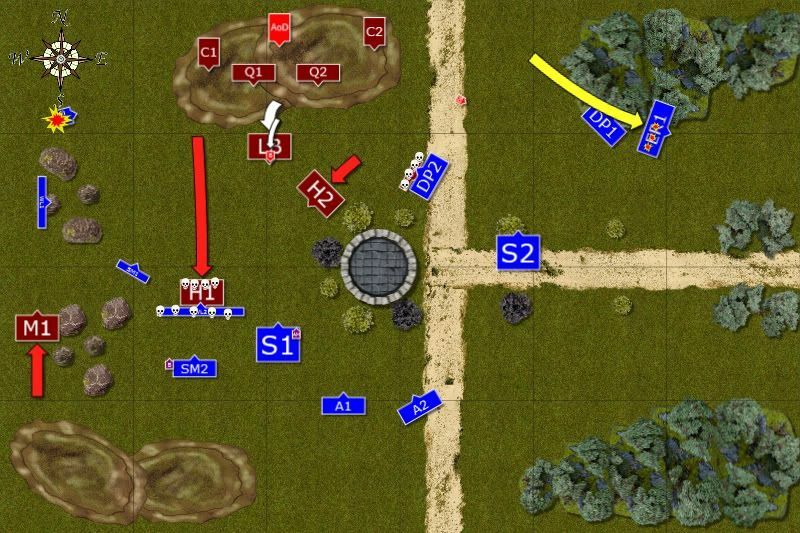 That was really bloody battle with many moments when one or the other army got some advantage. In the end Elves earned almost 200 VP more than Dwarves and claimed a very, very narrow victory. I know Vanyon is looking for some comments in particular addressing his army and its performance so I divided my comments into two groups. First about Dwarven army from my point of view and second about my thoughts about the battle itself. 2. Deployment - I think the deployment was good. 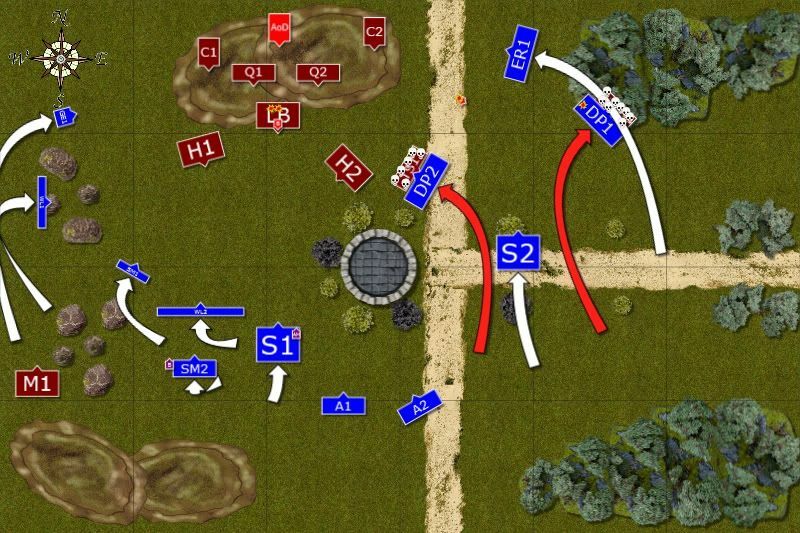 It was maybe a little dissapointing to see MSU army taking defensive mode and being more static at the beginning but in the end the game was still about movement phase. Positioning of Slayers was interesting and definitely slowed down my cavalry. They died but I got only one cannon and then very late in the game. 3. Rangers - they are a vital part of the army but I have a feeling Vanyon is still not using them to their full potential. It is tempting to position them close to the enemy. I would rather use their special deployment rule to position them where there is some gap in his deployment (if any) or exploit some in enemy's positioning. 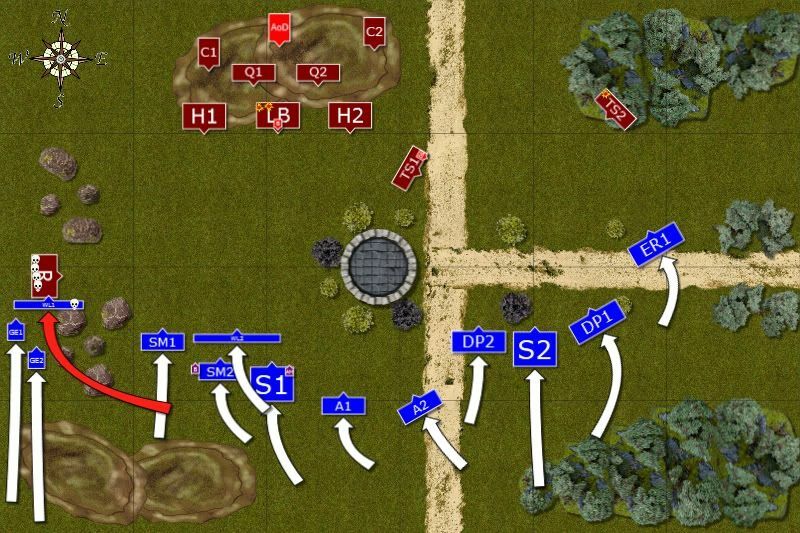 In this battle he positioned them very good, blocking reavers from making outflanking move. I would keep them in that dangerous terrein closer to his deployment though and didn't expose them for early charge. Especially from the flank! 4. Miners - Positioning of first miners was very good and with an Anvil it is really hard to avoid them. However, I would consider two things while using them. First, do they always have to enter the game behind enemy lines? Maybe it is more beneficial to do so even from your own table edge to reinforce the formation? Like with the second unit which could protect the cannon if was deployed on the road on the East. Sure, chargin Lions was good idea too, it is just to consider other option. ANd second, Anvil can make them march move too, so maybe instead of charging (if behind enemy lines) move them towards the rear of enemy formation and make charges next turn (possibly with some other unit charging from the front too!) next turn? 1. I didn't like my deployment. I was trying to counter Vanyon's crossbows by deploying Archers in one rank so that I could place Swordmasters behind them and be a little away for them to shoot he had first turn. But then he didn't have Strollaz and I was deployed too far away. As soon as I learned about it I did similar thing with Lions and in general it might be something to consider but it seems the better option is to deploy them in proper formation from the start just out of range. I tried to save Eagles only to find out they are good target for Miners. Again I think I would do better to position eagles in the line with other regiments, even use the tower to block LOS from cannons. I also think that deployin whole cavalry on the East would be better. I could have countered Slayers with DP and ER could charge the cannon earlier. 2. I have made huge mistake in positioning Swordmasters at some stage and could not counter-charge Hammerers. I need to remember they can charge twice so even if first attempt is failed they can still reach my lines. The charge with Spears was another huge mistake that costed me my Archmage and entire unit. I would have been better to leave Lions to keep fighting and counter-charge with Swordmasters next turn. 3. I had difficult decision what to charge with DP when I attacked Longbeards and I think it was a good call. However I had to hill no less but 7 of them to break steadfast which is not that easy. It was worth risking though and I just wish 4 Swordmasters with Bladelord could make it too. 4. There is a chance for a magic to work. I have observed that even with so many dice Runelord adds to dispel pool he adds only +2 to the dispel attempt. That means he usually has to use one more dice (at least) to have a good chance of stopping the spell. And as soon as he fails it is even easier to get the spell through. In that case I am willing to cast spells with one more dice than usual just to get higher casting value. 5. In the end I am happy with the results considering my serious mistakes and bad deployment. Could have been much worse!